Fighter, faker, student, spy: heart-pounding action and spine-tingling suspense intertwine in an electrifying debut for fans of emotional thrillers with just the right dash of high school drama. Seventeen-year-old Reagan Elizabeth Hillis is used to changing identities overnight, lying to every friend she's ever had, and pushing away anyone who gets too close. Trained in mortal combat and weaponry her entire life, Reagan is expected to follow in her parents' footsteps and join the ranks of the most powerful top-secret agency in the world, the Black Angels. Falling in love with the boy next door was never part of the plan. Now Reagan must decide: Will she use her incredible talents and lead the dangerous life she was born into, or throw it all away to follow her heart and embrace the normal life she's always wanted? And does she even have a choice? 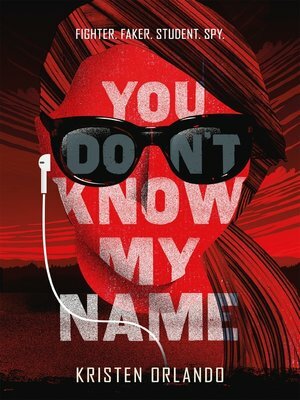 Find out if you are ready to join the Black Angels in debut author Kristen Orlando's You Don't Know My Name, the captivating and emotional first book in the Black Angel Chronicles, chosen by readers like you for Macmillan's young adult imprint Swoon Reads.